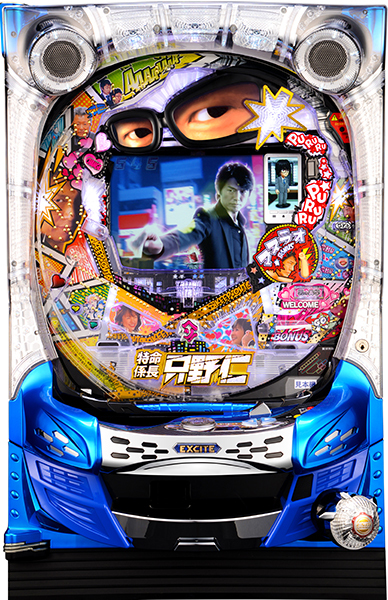 This time we will talk about a pachinko machine based on a popular office worker action manga that was even turned into a live-action TV series: Tokumei Kakarichō Tadano Hitoshi!! During the day Tadano Hitoshi is a regular run of the mill office worker at a large advertising firm called Denodo, but he also has a secret mission from the company chairman to stamp out trouble within the company!! Many of the situations from the original manga are preserved in this release during the reach animations!! It comes loaded with all kinds of accessories, large and small, as well as many live action cutscenes!! Give it a shot, and experience the activities of the remarkable Tadano Hitoshi via pachinko.